Dictionary and Terms | ESRD | Engineering Software Research and Development, Inc.
Terminology like Numerical Simulation, High Order Methods, Verification & Validation, and Simulation Governance are sweeping across the FEA world, yet some have ambiguous or misleading definitions. Become fluent in the lexicon pioneered by ESRD, our partners and associates, and brush up on common FEA technology terms. Experience for yourself what elite analysts already know: prove convergence by seamlessly increasing your solution resolution through p-extension. This is the Code of Convergence, and StressCheck® users abide by it. During post processing, all solution data is available for any output at any location in the mesh, not just at pre-defined coordinates. This means that it is little effort to show mesh independence, and therefore convergence, for anything in the model. The rate at which the potential energy of the system converges to the exact solution with systematically increasing degrees of freedom (DOF). P-version FEA has a convergence rate at least 2x faster than H-version FEA. Therefore, it’s always more efficient to use P-version. This makes StressCheck® the world’s premier FEA software for detailed stress, fracture mechanics, and composites problems. You get the right answer faster. Discretization error is the approximation error related to not having enough DOF to properly represent the exact solution of the model. The approximation error can be reduced by increasing DOF through decreasing the element size, increasing the number of element shape functions, or both. Verification is the process of showing that the data of interest has low discretization error. Degrees of freedom (DOF) represent the number of independent simultaneous equations associated with the mesh, the polynomial degree of elements, and the boundary conditions. The number of DOF can be increased in a mesh by increasing the number of elements or by increasing the polynomial order of the elements. DOF can be controlled efficiently in StressCheck® by increasing the order of the elements without changing the mesh density. Higher order and hierarchic shape functions are the engine behind what differentiates StressCheck®. Element shape functions are polynomial functions used for approximating, for example, the displacements in a mechanical simulation. Summation of these functions for all elements, each function multiplied by the best coefficient for minimizing the potential energy of the system, will typically represent the exact deformation of the model. Having hierarchic or layered shape functions which can be added automatically by p-extension means StressCheck® is ideally suited for the Code of Convergence. The estimated error in the energy norm is intended to measure the relatvie difference between the computed potential energy of the system (i.e., in a StressCheck® numerical simulation) and the estimated exact potential energy of the system. Therefore, it is a global measurement of numerical simulation quality. This does not mean the data of interest is converged, but is a necessary quality check. In StressCheck®, we only need to run a sequence of three solutions with increasing DOF and automatically solve a set of simultaneous equations to estimate the potential energy of the exact solution from which the estimated error is derived. 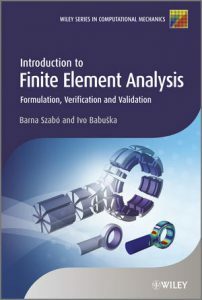 Finite element modeling is the practice of breaking the strict rules of implementing the finite element method such that the definition of the model and the attributes of the approximation are mixed, and errors of idealization and discretization are no longer distinguishable. The model is re-imagined as LEGO block connections at nodes and theories/elements are ambiguously mixed. This is a dangerous practice as the model should be treated independently of the discretization to be reliable. An example of finite element modeling is connecting 3D solid elements with 1D beam elements (mixing 3D and 1D elasticity). It is important to make a clear distinction between numerical simulation and finite element modeling: In numerical simulation an idea of a physical reality is precisely stated in the form of mathematical equations. Model form errors, uncertainties in input data, and the errors of numerical approximation are estimated and controlled separately. Hierarchic modeling is a process of determining the best model for the simulation goal(s), in which a sequence of increasingly complex models are explored until the simulation goal(s) is shown to be independent of “restrictive” modeling assumptions. For example, is 2D sufficient for determining the appropriate stress distribution, or must we go to 3D to capture it? Is the linear solution appropriate, or do we need to solve nonlinear equations? In StressCheck®, you can switch between these analysis types seamlessly. Hierarchic modeling empowers the analyst to search for the “right” answer without being concerned with the mesh. The idealization or modeling error is a measure of how well a mathematical model reflects the essential features of the physical system it is trying to represent. The idealization error is not related to the mesh and includes poor representation of the geometry, the boundary conditions, the material properties, and other modeling assumptions that do not capture the essential aspects of the problem. StressCheck® is the only FEA code designed to independently address the errors of discretization and idealization, a requirement for Simulation Governance. Mapping is related to the ability of an element to represent underlying geometry. StressCheck® uses high-order mapping so as not to introduce unnecessary discretization errors. The ideal mapping is geometric, which StressCheck® supports. This means the elements represent the CAD geometry perfectly. Mesh Independence should be the goal of every analyst: providing objective evidence that the results of the simulation do not depend on the choice of the mesh, the polynomial degrees of elements, or the mapping. Neither should it depend on the experience level of the analyst. The solution should only depend on the problem statement. This is a requirement for the Code of Convergence. In the proper implementation of the finite element method (FEM), a node is simply a vertex of an element, and has no other intrinsic importance to the element definition. StressCheck® is element-based and not node-based like traditional FEA codes, so information is available throughout the element without averaging or interpolation. In 2D and 3D elasticity, nodes should only be used to enforce proper element connectivity and to apply rigid body constraints when loads are in equilibrium. Numerical simulation is the practice of employing properly implemented computational techniques and methods for solving systems of equations discretely. StressCheck® focuses on using the finite element method to solve equations of elasticity discretely. The mathematical model representing the problem “at hand” (i.e., idealization) and the computational techniques employed to solve the mathematical model (i.e., discretization) should always be separated. Finite element modeling does not employ this method, therefore it is not considered numerical simulation. The process of systematically and hierarchically increasing the polynomial order of the element shape functions, increasing DOF and representing more complex displacement fields for the mesh. StressCheck® automatically performs p-extensions during the solution process to enable analysts to experience the Code of Convergence. P-version FEA refers to the implementation of the finite element method in which the error of discretization is reduced by systematically increasing the polynomial order of the element shape functions on a fixed mesh, instead of decreasing the size of the elements (H-version FEA). P-version FEA converges much faster to the exact solution than H-version FEA. StressCheck® can also do HP-version FEA, which is even faster. The user can guarantee the reliability of the result when the model is formulated properly. What if there is an error in model conceptualization? StressCheck® uses a hierarchic modeling framework to assess the modeling error independently from errors of approximation. Rigid body (strain free) modes must be canceled in order to solve an elastic system. In 2D elasticity, there are three (3) rigid body modes: two translations and one rotation. In 3D, there are six (6) rigid body modes: three translations and three rotations. Rigid body constraints may be applied to nodes to set a reference for displacements in the event of a self-equilibrated body. Otherwise, nodes should not receive any reaction in 2D and 3D elasticity. The procedures that must be established for the purposes of ensuring and enhancing the reliability of predictions based on numerical simulation. StressCheck® is the only FEA tool on the market today designed to meet the requirements of Simulation Governance. When very thin structures or ply by ply laminates are analyzed in detail, the through thickness stress/strain distributions are usually much less complex than the in-plane stress/strain distributions. To limit unnecessary DOF through the thickness, thin solids were introduced. Thin solids have superior performance than traditional shell elements in that shear and Poisson’s ratio locking are not a concern even if the structure becomes very thin. Total Load At a Point (TLAP) is a utility that transforms nodal forces and moments exported from a global loads model (e.g. NASTRAN plate/shell model) to make them suitable for the purposes of detailed stress analysis. TLAP applies statically equivalent tractions to surfaces and element faces permitting accurate detailed analysis in the regions of primary interest. A traction is a distributed load over a surface in units of force per unit area. A negative traction is a pressure. In StressCheck® we adhere to elasticity theory closely by applying our loads as tractions instead of point loads which cause singularities. Tractions can be defined as constants or formulae to more accurately represent the boundary condition. Validation is a quantitative assessment of the predictive accuracy of a model. Validation provides objective means for assessing the accuracy of the mathematical model by comparison of simulation results with experimental data. Verification is a process by which it is ascertained that the data of interest computed from the approximate solution meet necessary conditions for acceptance. Verification includes code verification, verification of the input data and solution verification.